Hard to tell. Hard not to tell. Now it’s too late. I didn’t want to burden you with such a story. I didn’t want understanding, pity or disgust from anyone then. I don’t want it now. But I wanted you one day to have the letters I never posted. Bone and Blood opens in Berlin August 2005 as the death of Brigitte’s daughter, Katharina brings back memories of her conception in 1945 when Brigitte was imprisoned in Ravensbrück Concentration Camp. Brigitte has never told her story of the war years but is challenged by Aisling, her great-niece and a student from Dublin, who arrives for the funeral. Aisling takes possession of a collection of unposted letters, written by Brigitte during war, and commandeers a laptop she finds in Katharina’s room. She gradually becomes hooked on images conjured up by the letters. They forge a relationship bonded by Brigitte’s memories and Aisling’s future, and Aisling learns as much about herself as about the past. Bone and Blood is the compelling story of two strong women, their difficult memories and the bonds of love and fear. Opening Sentences: Hard to tell. Hard not to tell. Now it’s too late. I didn’t want to burden you with such a story. I didn’t want understanding, pity or disgust from anyone then. I don’t want it now. But I wanted you one day to have the letters I never posted. 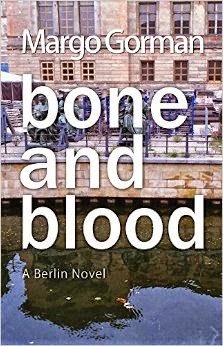 Bone and Blood is a multi-generational story about a woman's experience in a concentration camp in World War II. It is told through the perspective of Katharina as she reveals the secrets of her mother-daughter relationship with her dead daught to Aisling, her grand-neice. It is a poignant story of family relationships, mistakes, and enduring love. It touches upon the complexities of mother-daughter relationships that feels so real that I believed I came to know the characters on a personal basis. Moving and insightful. A lovely read!